Calligraphy Lessons Make a Great Gift! William A. Ward said, "The mediocre teacher tells. The good teacher explains. The superior teacher demonstrates. The great teacher inspires." "Your extraordinary talent and passion have certainly inspired me. Thank you again for your time and patience." "My calligraphy on the wedding invitation addresses wasn't perfect (plenty of room for more practice), but I got tons of compliments thanks to your great tutelage! Thanks!" 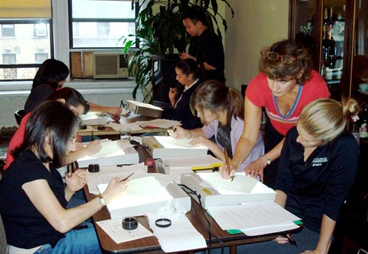 Private and Semi-private lessons in italic and copperplate/script calligraphy are available by appointment. E-Mail harriet@rosecalligraphy.com for more information. Great for the absolute beginner or to brush up on your skills! Email if you would like to be added to the waiting list for workshops or to make an appointment for a private lesson. Ms. Rose will reply with workshop & lesson prices and answer all of your questions.